The best horseracing punters in the world have the rare ability to find value where seemingly none exists. They are the individuals capable of finding a viable 12/1 outsider on a Class 5 handicap hurdle on a Thursday afternoon. How do they perform the betting equivalent of alchemy? It isn’t through magic! They can uncover viable trends which they use as a basis to make selections. Horse racing is absolutely laden with trends. Some of them are utterly useless while others can give you a decided edge over the bookmaker. Big races are a prime example of how trends are used and misused. For instance, in the upcoming Queen Elizabeth II Stakes at Ascot, 13 of the last 20 winners have been 3-year olds. This isn’t useful information if the majority of the field are 3yo! More relevant is the fact that 17 of 20 winners have been either favourites or third favourites. You can use this information to whittle down your field, and that’s the point. The purpose of trends is not to blindly follow the information; it is to use the data to create a shortlist of potential value bets. Successful punters need a good reason to back a horse, and not much of a reason to pass on one. I will probably do a longer article solely on draw bias in the future as it is potentially one of best ways to create a shortlist. For instance, Beverley and Chester have among the biggest draw biases in the UK for horses in 5f races. Basically, always take a close look at low drawn horses at these grounds. At Beverley, pay special attention to horses drawn in stalls 1-3 over soft ground in 5f races, but only if they have decent soft ground form or have shown some ability in the past. I glanced over past 5f results at Beverley, and in the most recent meeting on September 26, Line of Reason was drawn in stall #1 but was an 11/1 outsider. The draw alone warranted further interest; it was a Class 3 race, and while Line of Reason was in poor form, his races were mainly at Class 1 and Class 2 level. In the end, Line of Reason finished second by a neck – not bad for an outsider! The reason Beverley offers such an advantage for low drawn horses in 5f races is because they are drawn inside a tight turn; wide drawn horses also begin the race lower down the hill. Add soft ground to the equation and, suddenly, low drawn horses have a major advantage. Line of Reason was worth a second look because it was in a lower class race than he was used to and almost won despite setting off at a very nice price. When it comes to the condition of the ground (the going), it is always best to focus on race cards where the ground is heavy or firm as you can find trends relating to “specialists” on the going. This tactic requires patience because you can go long spells in UK racing where the ground is neither heavy nor firm. In races over heavy ground, especially longer events over hurdles, the race can turn into a real slog which means stamina is often a bigger advantage than class. As it’s rare enough to find races with Heavy going, it is extremely difficult to find instances where horses have sufficient Heavy form, but it well worth looking out for. Horses that specialise in Heavy or Firm ground may look decidedly ordinary or even poor on in other conditions. As a result, you could benefit from extremely good prices. Previous form on courses is always somewhat important, but it appears to play an even greater role in racetracks such as Ascot, Epsom, Kelso and Towcester among others. 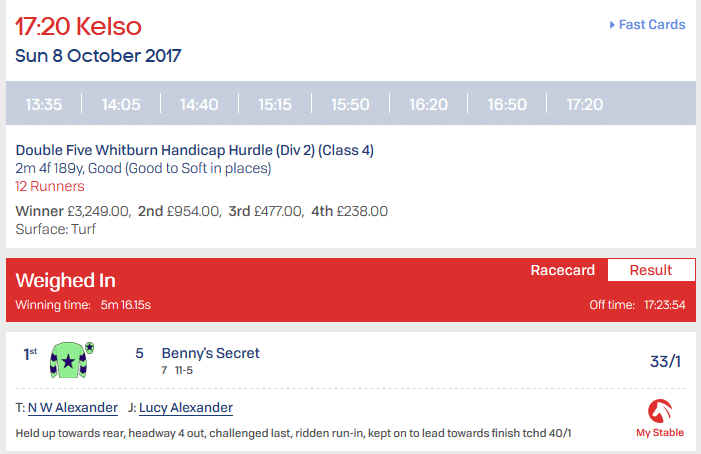 I checked out the Kelso racecard from 8 October and immediately found out that Benny’s Secret won a Class 4 hurdle over 2m 4f 189y at 33/1! This was clearly a surprise to bookmakers and punters alike…but should it have been? 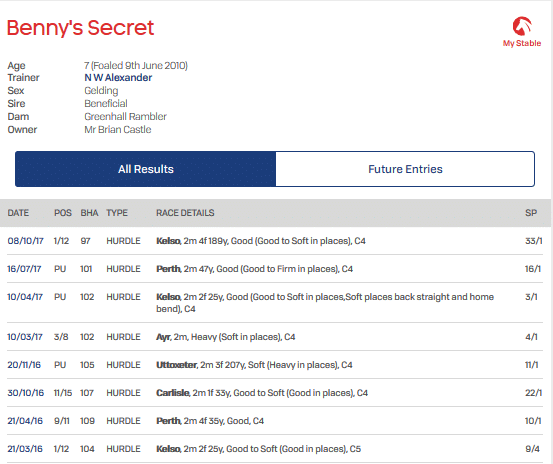 As you know, hindsight is 20/20, but Benny’s Secret has run at Kelso in the past. He fell in April but was one of the fancied horses at 3/1. In the race at Kelso before that, he won a Class 5. On this occasion, the race was over a slightly longer distance, but the ground conditions were similar. Of course, this information is less useful if there were several other course winners in the race; so bear that in mind. When it comes to trends in horse racing, they are only worth pursuing if they are relatively scarce and enable you to narrow down a field so you end up with a viable shortlist. Trends are useless if they apply to most of the runners in a race. By their very nature, useful trends are rare so don’t expect to find one every single day. If you cannot find any useful trends pertaining to any runners in a race, it is advisable to move on to the next one. After all, there are hundreds of races a week so you won’t have to wait all that long! Please note that ‘trends’ are only applicable to a horse when it has exposed form levels. It is not a good idea to back a horse because it met your criteria once in its entire career. It is normal for horses in handicap races to improve a lot in their first couple of races which makes form reading very difficult. Above all else, make sure you get the right odds for your selections in this scenario. When you wait so long for a good selection, you better get value! Pay attention to course form, draw bias and going along with other factors such as distance and class. Impatience is a punter’s biggest enemy so take your time, find the best and rarest trends and make some money.